Modern dentistry offers many ways to replace missing teeth. At the forefront of these methods is dental implants, but what makes them so special? You might have heard that they are sturdy and natural-looking, and that they can last for a lifetime, but all of these benefits stem from a single fact: implants are very biocompatible. They bond with your existing oral structures to become a functioning and important part of your body. How does this process work? “Osseointegration” is a big word, but the concept behind it isn’t tough to understand. Basically, it is a process through which the implants bond with your jawbone. It takes place over a period of months after your dentist surgically places the implants into your body. After the bonding happens, your new teeth have an extremely sturdy base. In effect, the implants act like natural tooth roots. Osseointegration is possible because the materials that implants are made out of are biocompatible — that is, they work well within the human body and are resistant to corrosion. A titanium alloy is the usual material of choice for implants, but other substances, including zirconia (a ceramic-like metal, are sometimes used. Not only does osseointegration ensure that your new teeth aren’t going to slip around in your mouth, but it can also help to prevent bone loss. When you lose teeth, your jaw may start to wear away, resulting in weakened bones and alterations to your face shape. This is a problem that occurs even when people replace their teeth with dentures or traditional bridges, and it happens because there are no tooth roots to keep the bone in good shape. 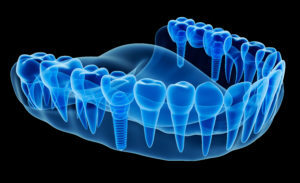 Because implants act like tooth roots, they can slow down or even prevent bone loss. However, keeping implants clean is vital; if an infection occurs, the implants can actually cause your jaw to weaken. After you have your surgery, both you and your dentist will need to be diligent about looking for potential signs of trouble. Don’t be too worried, though — the vast majority of implant cases are successful. In order to be a good candidate for dental implants, you need to have a strong jaw that can support your restored smile. If tests determine that your bone isn’t dense enough or tall enough to accommodate the implants, you might need a bone graft. The grafting procedure may use artificial bone or bone from another part of your body to fortify the area where the small titanium posts will go. Do you want a strong, healthy, and natural-looking smile? Dental implants might be the ideal solution because they become part of your body and work well with your existing oral structures. The team of dentists at Brooks Dental is committed to helping you have a healthy, attractive smile. If you have questions about dental implants or any other restorative procedure, please contact us at 617-846-1811.